If you didn't buy your house with a suitcase of cash, there's a good chance you took out a mortgage from a bank or a lending institution. Often, when you take out a mortgage, the banker or broker tries to sell you on mortgage insurance. If you're reading this, taking out mortgage insurance likely sounded like a smart idea at the time of taking out the mortgage. In an ideal world, mortgage insurance is supposed to protect you in the event you can't make your mortgage payments in the event of accident, illness, injury, death or disability. Basically, if you can't pay your mortgage payments because you're disabled or injured, you should be covered under the mortgage insurance policy. But the world is not perfect and mortgage insurance often doesn't work the way you had planned. Sometimes you didn't read the fine print. Other times, the mortgage broker who sold you the insurance told you one thing, but your policy said something completely different. The result is that your mortgage insurance claim gets denied and you run the risk losing your home. Nobody wants to see that happen, especially after you've been paying your premiums diligently for years and years. If you have mortgage insurance and your claim has been denied, call Goldfinger Law right away. We have experience lawyers who have handled countless mortgage insurance claims to assist you. We have recovered millions of dollars from insurance companies which have denied mortgage insurance claims, only to have them reversed; thus turning your denied mortgage insurance claim into an approved claim. That means the collection agencies stop calling, the bank won't foreclose on your home, and you can keep living your life with the peace of mind knowing that you will have a roof over your head for you and your family. At Goldfinger Law, we have the knowledge to go head to head with insurance companies which provide mortgage insurance such as TD Insurance, RBC Insurance, BMO Insurance, Great West Life, Standard Life Insurance, SunLife, Canada Life, Co-Operators, Zurich and other large insurance companies and financial institutions. If you have been injured in a car accident, slip and fall, boating accident, have chronic pain, a brain injury, a pshychological injury, depression, anxiety, fibromyalgia or any other injury, illness or disease which is preventing you from working, then we would be pleased to help you. We have helped countless mortgage insurance claimants keep their homes and restore their dignity. Let us help you get what you deserve. 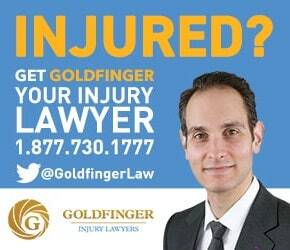 Contact one of our personal injury lawyers today info@goldfingerlaw.com or 1-877-730-1777. We would be pleased to hear from you.